I sometimes come across the occasional author who will write a book and get it published, and once that’s all done s/he thinks their job is done. S/he waits for the sales to come in, and does very little, if anything, to promote the book. S/he might even argue that it isn’t his/her job to promote the book. Unfortunately such an argument is a denial of the reality that the best sales person for a book is the person who wrote it. I’m an author myself, as well as an editor/publisher, which gives me a holistic perspective of the entire industry. Immanion Press is a small publisher. We have a tight budget, and so while we edit and publish the book and even promote it by sending out review copies to the appropriate reviewers and offering publicity advice to our authors, in the end we expect that authors will do a lot of the foot work of promoting and marketing their books. Additionally, while we have some distribution channels, we are a print on demand publisher, which means our books don’t get put on the shelves of the big book stories. because if not enough copies sell those books get returned to us, which can actually cause a significant financial issue and has killed many a small press in its time. Anyone who wants to get published by us is expected to be ready to promote and market themselves. We can help, but you also have to help. However, even with larger publishers that operate on a conventional model of publishing, and can offer some publicity and marketing resources we don’t have to offer, there is still an expectation that the author will actually market his/her book to the target audience that will read the book. Unfortunately a lot of authors don’t promote their books. They are in love with writing the book, and getting royalties from it, and perhaps being recognized and asked to sign a copy of the book. What they don’t realize is that their books is carried as a result of the very successful authors who are marketing and promoting their books. Each year a publisher has to pay a fee to keep a book in print and usually that fee is covered by the income derived from the sale of the successful books. The less than successful books are carried along, and the author who doesn’t promote his/her books just sits on his/her laurel, content to let others do the work. I think it should be an industry expectation that a given author will actually go out and sell his/her book. S/he may say it’s not her job and that s/he just wanted to write the book, but the truth is that while a book is a commitment, the truly hard work doesn’t begin until the book is published and the author actually needs to promote it. This means the author needs to present workshops at conventions, but also at book stores. This means the author needs to write articles for relevant sites that reach his/her target audience. This means the author needs to get interviewed on radio shows and in magazines that his/her target audiences listens to and/or reads. This means the author has to create a website/blog and maintain a social media presence that is used to connect with his/her target audience on a regular basis. This means an author has to realize that by writing a book s/he started a business and if s/he wants that business to succeed then s/he has to get off the laurels and start working. Any author who doesn’t want to do all of that work shouldn’t write a book and certainly shouldn’t expect a publisher to bear the onus of selling the book. A good author works with his/her publisher. S/he actively markets his/her book and keeps the publisher in the loop so the that the publisher can actively help in the promotion of the book. And the publisher in turn does what it can to distribute the book, and market the author by promoting what the author is doing via their own social media channels and through other mediums as well. The job isn’t done by just one or the other but by both to make the book successful. We are pleased to announce the first of our new titles for 2013. 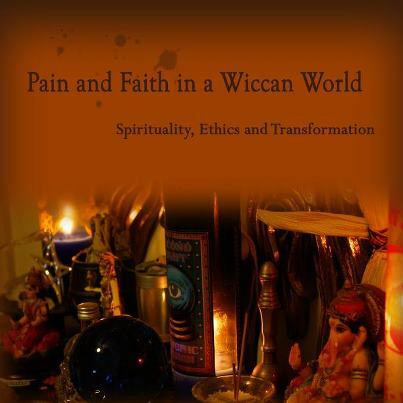 In February, we will be publishing Crystal Blanton’s third book ‘Pain and Faith in a Wiccan World’, which fuses spirituality and counseling concepts to add a deeper layer of personal growth and connection to living the Wiccan path. February also sees the release of two new fiction titles. Tanith Lee’s eagerly-awaited next volume to her Colouring Book series, ‘Cruel Pink’ is a psychological fantasy. We will also be publishing Valentine Williams’ comedy of horrors novel ‘The Poison Garden of Dorelia Jones’ in both printed copy and ebook editions. Pantheacon 2013 is coming up fast. The 19th Annual PantheaCon will be held Feb. 15 – 18, 2013 (President’s Day Weekend) at the Doubletree Hotel in San Jose, CA This year’s theme is Co-operation, Tolerance & Love. Immanion Press will be offering a panel and we will also have authors Tony Mierzwicki, Lupa, Crystal Blanton, Lisa Spiral, Erynn Rown Laurie, and Taylor Ellwood there. To see the full schedule go here. Erynn Rowan Laurie is doing a talk on Irish Healing Deities: Beyond Brigid that will address some of the other gods, goddesses, and heroic figures in the Irish pantheon who are also associated with healing. She’ll be participating in a joint workshop with Rev Jessie Olson of the ADF on Spirit work and PTSD. There will also be an informal chat about my Brigid pilgrimage in the ADF hospitality suite. Crystal Blanton is involved in four presentations at Pantheacon this year. Restorative Community Circle; Tolerance, Cooperation and Love, The Shades of Ritual; Minority Pagans in Practice with some of the authors of the Shades of Faith Anthology, the Patheos authors panel addressing intrafaith in the Board room and the Immanion Press panel. Taylor Ellwood is presenting the Wealth Wizard’s guide to financial success.